Trailer wheels get doused in harbors, rivers, and lakes. Why does this matter? The hub feels hot to the touch during refueling stops on the highway. This can also be the result of a brake shoe or brake pad rubbing while traveling. Grease on the bottom of the boat hull near the trailer wheel or grease on the trailer frame near the trailer wheel. Obvious noise is heard when spinning the wheel while it’s jacked up. If the usually reliable dust cover suddenly comes off, this can be the result of excessive heat and pressure buildup in the bearing assembly. Consider how the wheel turns around the axle’s spindle; peer inside the wheel’s hub to the bearings (figure below). In order to keep the loaded wheels turning smoothly, bearings need to be amply lubricated with grease. That bearing grease is kept in place by one or more seals. Traveling down the road causes the hub and bearings to heat up. When you then immerse that heated wheel assembly in cold water, the temperature drop causes a vacuum inside the hub, which draws gritty seawater into the wheel assembly; damage to metal parts can follow swiftly. 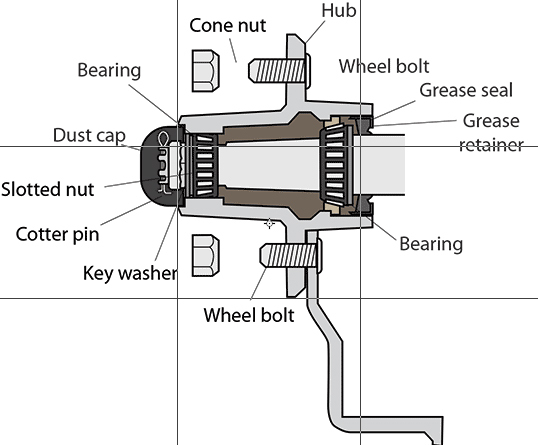 The figure above shows sets of bearings contained within the wheel’s hub. The bearings are tapered to match the camber of the spindle. These should be examined seasonally or every 2,000 miles and repacked with grease. To do that, first ensure that the opposite wheels are chocked and that the trailer is safely positioned on a stable jackstand on a level surface. 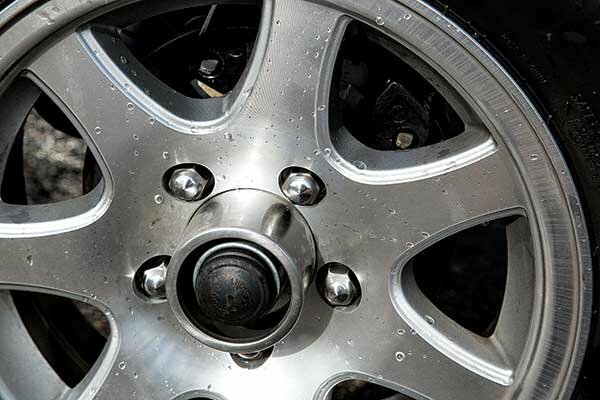 Remove the dust cap and retaining nut, then slide the wheel assembly off, taking care not to drop the bearings. Avoid contaminating them with grit. Clean the bearing with a solvent such as kerosene, and inspect them for pitting or any other deformation. Also inspect the spindle for any scoring or pitting. If the surface of either the spindle or the bearings isn’t absolutely smooth, replace it. To reinstall the wheel assembly, liberally grease the spindle, and pack grease into the bearing races. Carefully fit the grease retainer and bearings, then tighten the retaining nut with a wrench. Seat the wheel on the spindle by rocking it gently back and forth. While maintaining pressure on the wrench, spin the wheel until it will no longer rotate. This ensures that both bearings are properly seated. Finally, back the retaining nut off a quarter-turn, and lock it in place with a cotter pin. A bearing protector solves the problem of launch-time vacuum pressure mentioned earlier. Available from several companies, it fits in place of the dust cap. A fitting at the hub allows you to pump grease at positive pressure into the assembly. Frequently launched trailers should have them. Written for BoatUS by Tim Murphy, coauthor of Fundamentals of Marine Service Technology (ABYC, 2012), from which this article is adapted.